Language development programme of Kalvi trust is committed to provide basic language learning support to underprivileged children to perform well in their education curriculum. 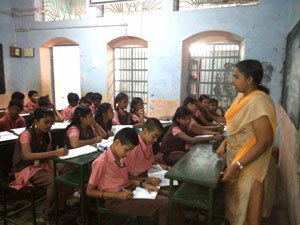 IT aims to improve Listening, speaking, reading, writing skills of the children. Kalvi believes that language learning is the base for education. The key issues that, children from weaker sections are not keen in language learning which affects their better performance in language. Further, most of the children of weaker section are studying with the mother tongue medium of learning in their schooling and when they shift in to higher studies of graduation the medium of language will be in English. Hence shift in language medium and they were not have sufficient skill with the language learning is affecting their performance in the graduation which is the basic challenge facing by the children of weaker section. Moreover, most of the children were hesitating and quit their education with higher secondary is mainly because of the issue in language development. The programme of quality education is trying to ensure language learning with the children of weaker section. Kalvi trust has its network schools which are government and government aided schools in rural areas and urban slums of kalvi working locations. There the quality trainers on language development from kalvi will go and deliver the course to all students’ with the specific time schedule. Kalvi is having separate assessment process of the student’s before and after the language development programme to assess the change on it.